I am developing a project for my term project and in one of the modules it gets two coordinates from me, finds the shortest path and shows the route. But for about a week now, the plugin doesn't seem to find any route. I double check with the routing server address provided on QT's webpage and tried anything seems like a host address with no luck. I also made contact with Aaron McCarthy from QT to address the problem, still no working solution. But one of he recommended was to run a routing query on OSM website which worked just fine. What I am asking, -is there any routing server host I can try or test if mine's working, -any known issues anyone experienced working with OSM and/or QT Location API lately ? Please state which routing server address you are using to make queries. Oh, ok. Here it is : "http://osrm.server.address/viaroute"
osrm.server.address is not a valid domain name, so you won't get any results from there. it's what presented on http://doc.qt.io/qt-5/location-plugin-osm.html . And the odd thing is this was working perfectly until a week ago. Also valid domain names are welcomed. I guess until a week ago you did not specify the (optional!) parameter osm.routing.host. Then it defaulted to http://router.project-osrm.org/viaroute if I understand your linked Qt docu page correctly. http://osrm.server.address/viaroute is just a placeholder address which is used in the example parameter listing. 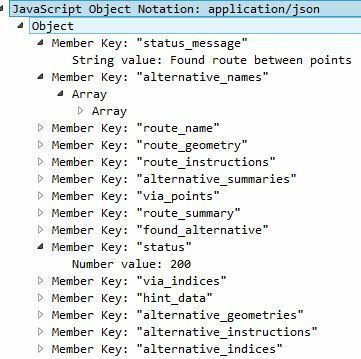 I suspect there been some adjustments in Qt side about receiving and parsing the json file.